One of the things myself and Harry particular enjoy doing is our cinema trips. We are regulars at Vue and for the time we have together we can be found in the box office at least once a week – it’s a staple of our relationship. So here are a few top picks that we have come across; you may find a common theme in what we like to see: very much actioney-thrillery types that being said Harry was willing to see The Greatest Showman after much persuasion haha. So, please do brace yourselves for the first post from Harry. I have told him to keep it clean and nice. Enjoy! Well… Might have to disagree with you on that one. Admittedly the main allure for this one came from my excessive persuasiveness and always insightful opinion; “that’s got 50cent in” Anything it else was a bonus as long as his idol was there. It also allowed for me to spend the succeeding hour after the film going into great detail into how the film reflected a lot of the plot of ‘Grand Theft Auto 5’ which I'm sure I will take great delight in posting about in the near future which I'm sure you'll all enjoy. What more could you ask for for a couple of hours: Heists, fights, shots fired and Gerrard butler wearing nothing more than a bullet proof vest and a police badge. Sounds good to me doesn't it? Spotting a theme here? To paraphrase Michael Caine, King of Thieves is a British thriller with an experienced and iconic English actors that certainly blows the bloody doors off - clever eh?. King of Thieves takes on the Hatton Garden Heist of 2016 where a group of men aged 61-73 pulled off one of the most notorious robberies on British soil since the great train robbery of the 60’s. As Reader, Michael Caine delivers haunted gravitas; his character’s wife has just died and he’s the one felon truly torn between going straight, something he promised her he would do, and doing one last job; whilst this may sound a touch on the clichéd side does provide the thrills in the right places and is something I will be watching again. Ray Winstone, Tom Courtney and Michael Caine in the same picture. You can’t go wrong. As a side note, this marks the first of a break in trend for us. Like I said under normal circumstances we’d be at Vue taking in the £4.99 bargain. 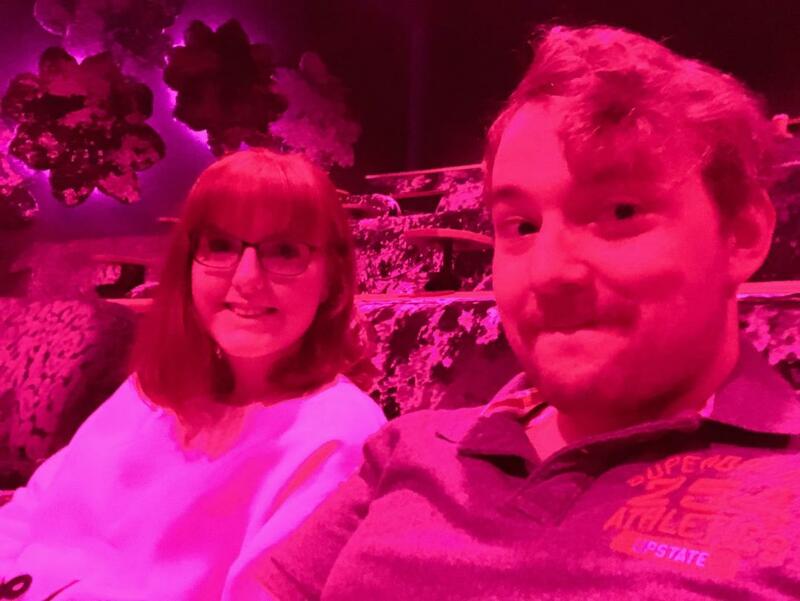 However on this occasion, while on a short break in Barton we took in the newly developed ‘Flower Bowl” Part of the vast complex is its cinema which is so intimate and homely I love it – plush sofas, foot rests, buckets of popcorn. I highly recommend if you can make it you go. If you fancy a laugh then look no further. Gringo differs from most Tarantino-esque flicks in that it has a clear lead, in David Oyelowo’s (Gring) hapless Harold Soyinka, a Nigerian immigrant and all-round nice person who’s had it with his dead-end job and mounting debt, but just finds himself getting deeper with every terrible decision he makes. Sounds quirky enough. Gringo differs from most Tarantino (of pulp fiction fame) homage flicks in that there are heaps of laughs and sound bites SOMEOME will no doubt be repeating and using for a good while – 'Withnail and I' springs to mind. Think Bourne Identity, meets Pulp Fiction, meets Narcos meets the Chuckle Brothers and you have Gringo. Charlese Theron doesn’t get much of a look-in and the sub plot of which she is major too takes somewhat of a background, you feel Harold is punching bag for the audience at times you feel for him but hey.. I like a laugh. Well guys that was my top 3 picks of our cinema visits. Hopefully i'll be back soon for more posts and we’ll get to know each other more as time goes on. Happy reading and see you all soon. 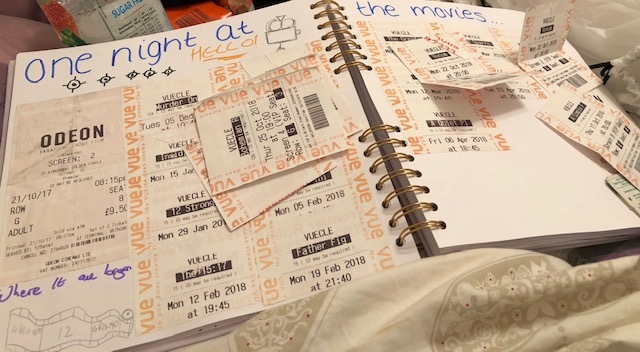 And just as a little side note... just to show how often we do go and the amount we have seen, we must get onto Vue for a potential loyalty scheme! I'm the same with cinema trips, they're the best way to spend a date night. The last movie I saw was Fantastic Beasts 2, which was amazing. King of Thieves sounds really good, so I'm going to have to hunt it out. 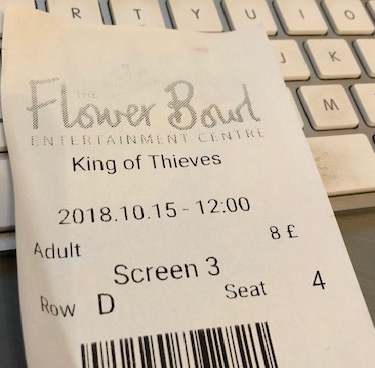 Really wanted to see King of Thieves but never got round to it! Will definitely have to pick it up when it's out on DVD!